New York after Hurricane Sandy showing haves and have-nots. FEMA’s refrigerator is bare of water, but not to fear. It put out to bid a RFP for 2.3 million gallons of bottled water to be delivered to an East Farmingdale, New York distribution center by Monday, November 5th.It has no idea how to distribute it from there.Â Meantime, we have no idea how bad it is for the dispossessed or those without power. Where’s Obama? He has a weekend packed full of campaigning planned. On Saturday, he heads to Ohio, WIsconsin, Iowa and Virginia. On Sunday, he hits New Hampshire, Florida, Ohio and Colorado. I guess you could say the “Sandy” afflicted are on their own! It appears that Tropical Storm Isaac will make a direct hit on New Orleans. Isaac is expected to strengthen into a hurricane by between today and Tuesday. Forbes has an analysis of Tropical Storm Isaac, currently lashing the Florida Keys.Â Isaac is expected to strengthen into a hurricane over the very warm Gulf waters and make landfall somewhere between Louisiana and the Florida Panhandle.Â Forbes thinks it could rival the damage of Katrina, which hit in 2005 and cost $110 billion. It is expected that it will have a significant affect on energy prices possibly sending oil above $100 or even $110 per barrel.Â Consumers would take a hit to the wallet over rising gasoline prices already at $4.00 a gallon. Hurricane force winds extend outwards only 15 miles to the east of Tomas’ center, and only the extreme tips of Haiti’s southwest and northwest peninsulas will receive hurricane force winds. Tropical storm force winds of 39+ mph extend out about 140 miles to the east, and Tomas will pass far enough from the Port-au-Prince earthquake zone that winds there will not exceed 30 – 35 mph. However, the northern Haitian city of Gonaives will receive 40 – 45 mph winds this afternoon and this evening, as will the eastern tip of Cuba. 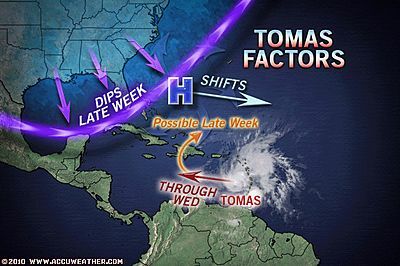 Rainfall is the primary concern from Tomas, though, not wind. Satellite estimates (Figure 1) indicate that Tomas has already dumped up to 6 inches of rain on Haiti’s southwest peninsula, and 3 inches in the Port-au-Prince earthquake zone. Recent microwave imagery (Figure 2) shows that while the heaviest rains from Tomas lie in the west eyewall and will miss Haiti, a long band of heavy rain with rainfall rates of 1/2″ – 3/4″ per hour lies to the southwest of Port-au-Prince and Gonaives, the two most vulnerable cities in Haiti to catastrophic flooding. 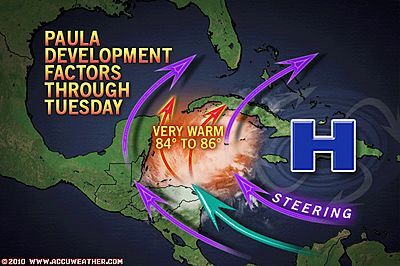 Tropical Storm Paula has formed off the coast of Honduras. It currently has maximum sustained winds of 70mph and is expected to become a Cat 1 Hurricane on Tuesday. It appears to be heading directly for Cancun and Cozumel. Florida and the Florida Keys could be vulnerable later this week.